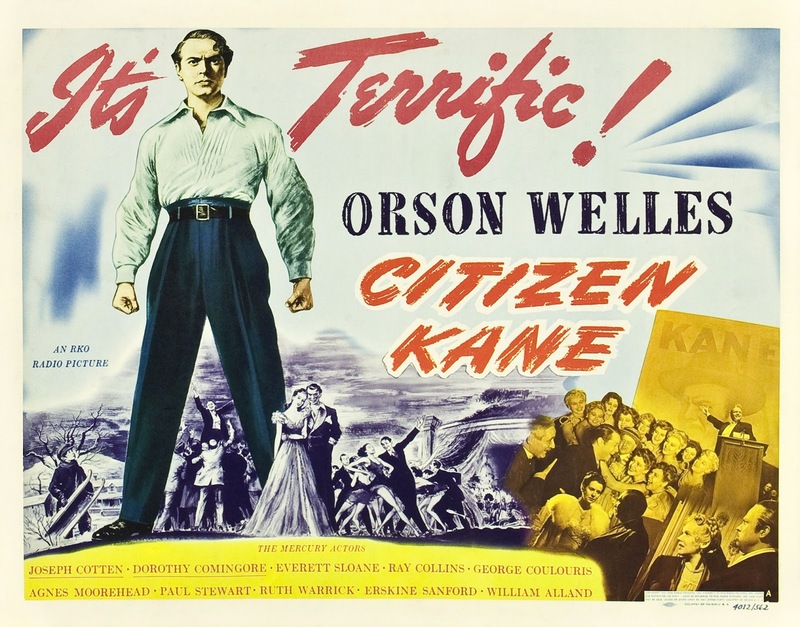 Citizen Kane (1941), starring Orson Welles, is one of the 1001 classic movies you should see. Each Monday, I'm going to recommend a classic movie you should see (for the reasons behind the 1001 series and reviews of earlier films covered go here). Throughout May, I'll celebrate the 75th anniversary of Citizen Kane with a look at that film and three other movies that were nominated for best picture at the 1941 Academy Awards. Today, I'm starting off with Orson Welles' masterpiece. Note: I covered 1941 best picture nominee Suspicion during my Hitchcock series in February. You can check it out here. Citizen Kane begins with the cryptic word, "Rosebud," which is uttered by powerful newspaper magnate Charles Foster Kane (Welles) on his deathbed. A young reporter (William Alland) is assigned to find out the meaning of Rosebud, so he goes in search of the answer from several people who knew Kane, including his second wife (Dorothy Comingore), his former best friend (Joseph Cotten), and his business manager (Everett Sloane). 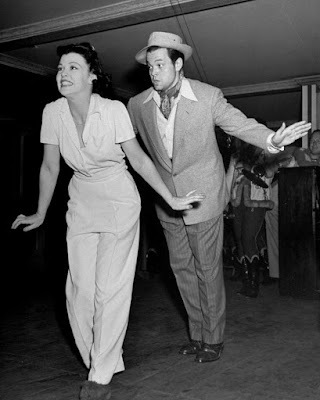 By 1941, the 26-year-old Welles was a superstar thanks to his now-legendary War of the Worlds radio broadcast and his success on Broadway with his Mercury Theatre Players. He was courted by many studios, but he accepted an offer from RKO Pictures that allowed him to choose his own story, cast, and crew and have complete creative control over his films, After a few false starts, Welles and screenwriter Herman Mankiewicz devised an original story that was based on real-life newspaper magnate William Randolph Hearst and on elements of Welles own life story. Despite earning critical raves, Citizen Kane only did moderate business at the 1941 box office. It was largely forgotten until 1956 when it received a re-release and was highly praised by cinema cognoscenti like French critic Andre Bazin. Citizen Kane was one of 10 films nominated for best picture in 1941 and although eventual winner How Green Was My Valley and the other nominees are all wonderful films, Kane is in a category all by itself. Its innovations are endless from Welles and Mankiewicz's groundbreaking non-linear screenplay to photography director Gregg Toland's masterful cinematography to composer Bernard Herrmann's avant-garde score. It was also an extremely influential film, paving the way for the film noir genre that flourished in the postwar era, and the use of unreliable narrators in films like Rashomon. 1. No. 1 Film. Citizen Kane is often cited as the greatest movie ever made, and, I agree, up to a point. Kane has some stiff competition for this honor from the likes of Ingmar Bergman, Alfred Hitchcock, Akira Kurosawa, and John Ford, but I can't think of a single American film that has been as influential as Kane. 2. Deep focus cinematography. If you've heard one thing about Citizen Kane's technical innovations it is probably Welles and Toland's use of deep focus cinematography, which basically means that everything in the frame stays in focus. You'll notice it in the nightclub scene where the reporter is talking on a pay phone, and in the snow scene where Kane's mother (Agnes Moorehead) is talking with his future guardian (George Coulouris) while a young Kane (Buddy Swan) plays outside. 3. Mercury Players. Welles drew heavily from his Mercury Theatre troupe of actors for Citizen Kane. This movie introduced several great performers, including Cotten, Moorehead, and noir perennial Paul Stewart, who plays Kane's oily butler. 4. Humor. There's so much talk about Citizen Kane as a cinematic monument that it's easy to overlook the humor in the film. Erskine Sanford is quite funny as an exasperated newspaper editor, but Fortunio Bonanova steals the show as an excitable vocal coach who is trying to make Kane's second wife into an opera star. 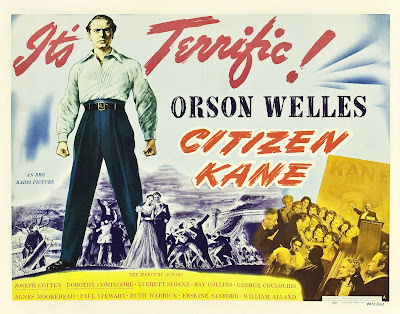 Other critics: Citizen Kane is one of the few movies that have an 100 percent rating at Rotten Tomatoes, and Leonard Maltin calls it "Welles first and best, a film that broke all the rules and invented some new ones" in a four star review for his Classic Movie Guide. Critics in 1941 mostly handed out raves, including the hard-to-please Bosley Crowther of The New York Times. He wrote, "it comes close to being the most sensational film ever made in Hollywood. Count on Mr. Welles: he doesn't do things by halves. ... Upon the screen he discovered an area large enough for his expansive whims to have free play. And the consequence is that he has made a picture of tremendous and overpowering scope, not in physical extent so much as in its rapid and graphic rotation of thoughts. Mr. Welles has put upon the screen a motion picture that really moves." 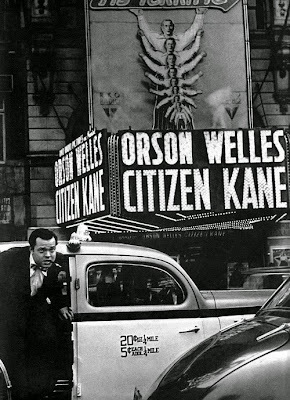 Critic John O'Hara of Newsweek even topped Crowther's praise with a review that praised Citizen Kane as the best film he had ever seen, and Welles as "the best actor in the history of acting." Suzanne Ridgeway and Orson Welles rehearse the Charlie Kane number in Citizen Kane (1941). The bottom line: Citizen Kane is not only an important masterpiece in American cinema for its technical innovations and groundbreaking story structure, but it is a highly entertaining film that, even after dozens of screenings, gives viewers something new to discover. Availability: Citizen Kane will air at 8 p.m. May 10 on TCM. It is also available on DVD, Blu-ray and video on demand. Next week, I'll continue May's theme of 1941 best picture nominees with a look at The Maltese Falcon. Amanda, I agree that it's a must-see film classic. It's not my favorite Orson Welles film, but one must admire its tremendous artistic and technical achievements. It's the little touches that amaze, such as the seating of Kane and her wife at the dining room table during a brilliant montage. Plus, I would die to do a scene like the one where Kane destroys the room! My favorite Orson Welles movie is The Magnificent Amberson, but Kane is such an amazing accomplishment. There is something innovative and new in every scene. Agree on both counts. Wish Orson's original ending of AMBERSONS would be discovered somewhere!